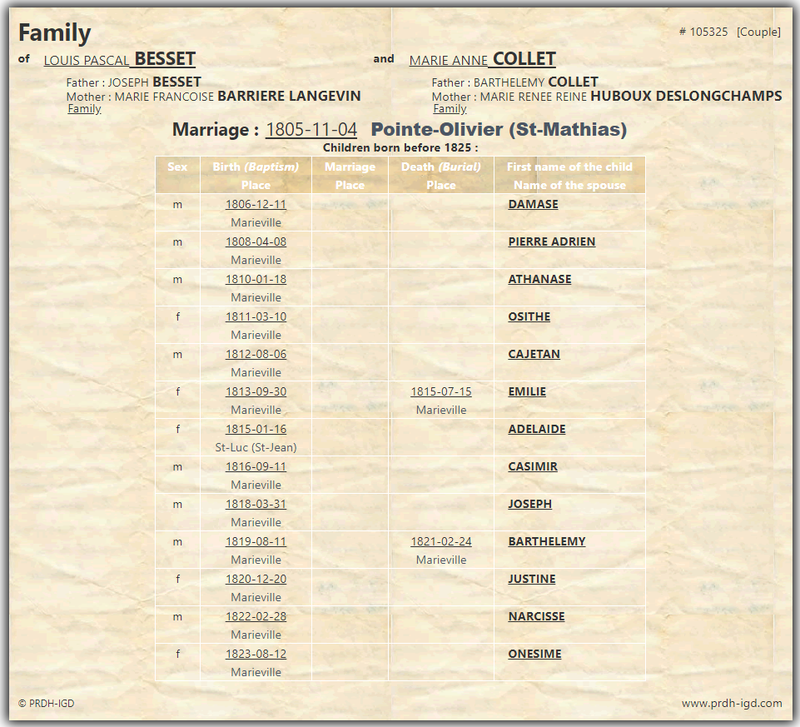 More than a year ago, we announced the addition of the family reconstructions from 1800 to 1824 to the PRDH-IGD database. This massive update represents the addition of 787 675 individuals and 94 444 families to the database. In total, we are talking about 8 500 000 new family links to explore in the PRDH-IGD database! To put this into perspective, the PRDH-IGD database contained a total of 870 763 individuals before this update. That number has now nearly doubled! To give you a more concrete overview of these additions, here is a Family File before and after this week’s update. You will notice the absence of events dated after 1824 on the first image. In the second picture, you can see many new individuals in the family, those born after 1824, as well as several events that were not associated with this family before the update. First, it should be noted that the PRDH-IGD is made up of 2 elements. 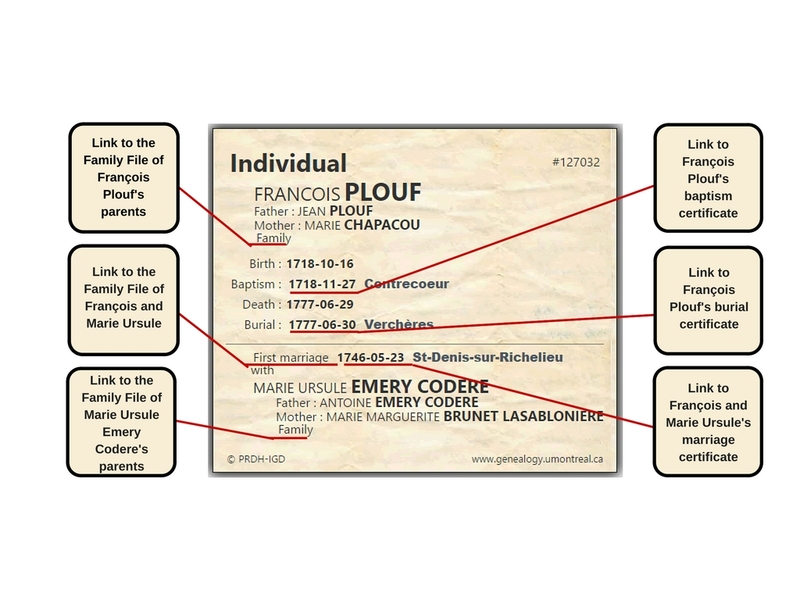 These two elements work in tandem to form what could be described as a comprehensive family tree of the entire Catholic population of the Province of Quebec from 1621 to 1849. The first element is the repertory of vital events. 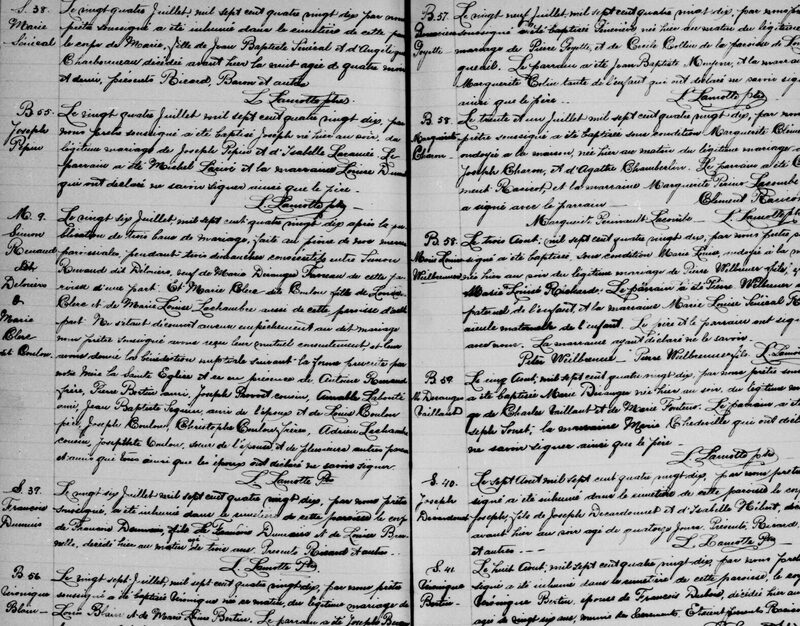 This is a directory of all Catholic baptism, marriage and burial records celebrated in Quebec between 1621 and 1849, more than 2.5 million records. The records are presented in the form of certificates. The second element is the genealogical dictionary of families (family reconstructions). 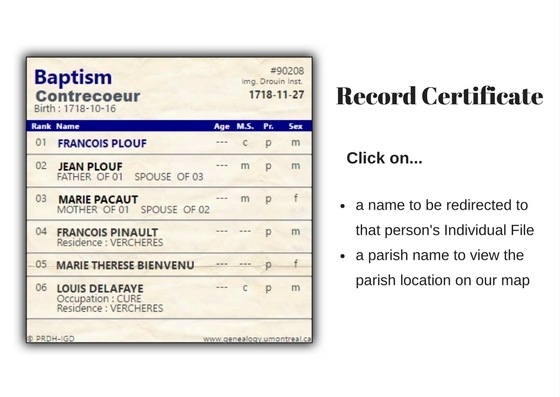 In addition to baptism, marriage and burial records, the PRDH-IGD contains what we call individual and family files. Any individual mentioned in a record from the database is given his own individual file. 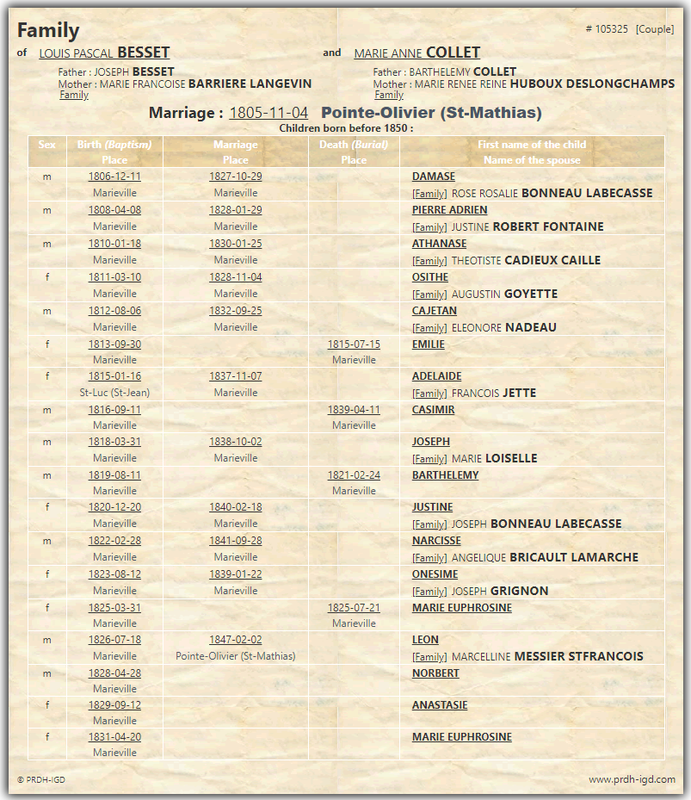 The individual file centralizes all the mentions of the individual in the database, such as the person’s baptism, burial and marriage. The individual file also mentions the parents as well as the spouse(s). Every name and date in the individual file can be clicked to access the related individual file or record certificate. Similarly, any married couple mentioned in a record in the database is given a Family File. This Family File includes all the children of the couple as well as a link to the events where these children are mentioned. Again, all the names and dates in the file are links to the individuals and events in question. It is therefore possible to navigate from file to file and from record to record with a simple click. 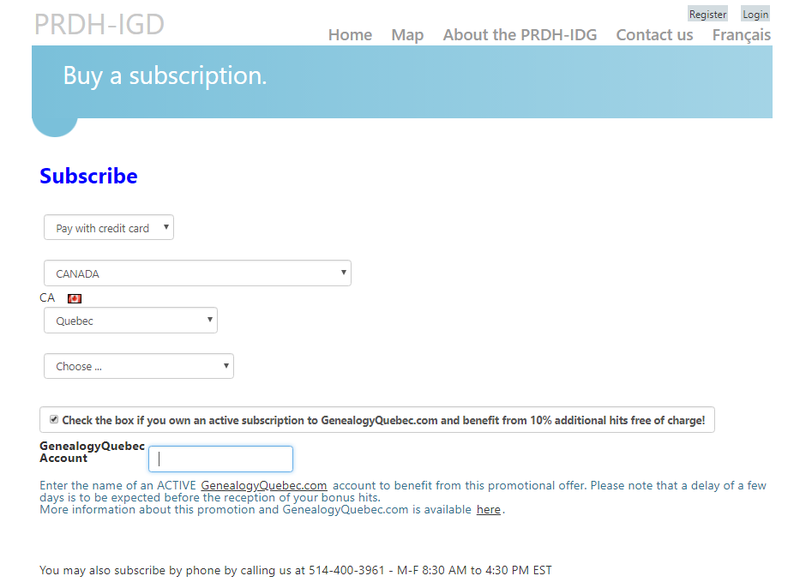 You will find a more in depth explanation of the PRDH-IGD database on our blog. A hit is charged each time a page is displayed, except for the list of references obtained from a query, which is not charged. A subscription thus corresponds to the right to view a certain quantity of one or the other of the following elements: a certificate from the Repertory of vital events (record certificates), an individual or family file from the Genealogical dictionary or a couple file from the Repertory of couples. What are the differences between GenealogyQuebec.com and PRDH-IGD.com? What are the benefits of being a subscriber to both websites? Please note that this price adjustment will not be applied until Friday, September 14, 2018. You will therefore have a full week following the receipt of this newsletter to take advantage of the old rates. 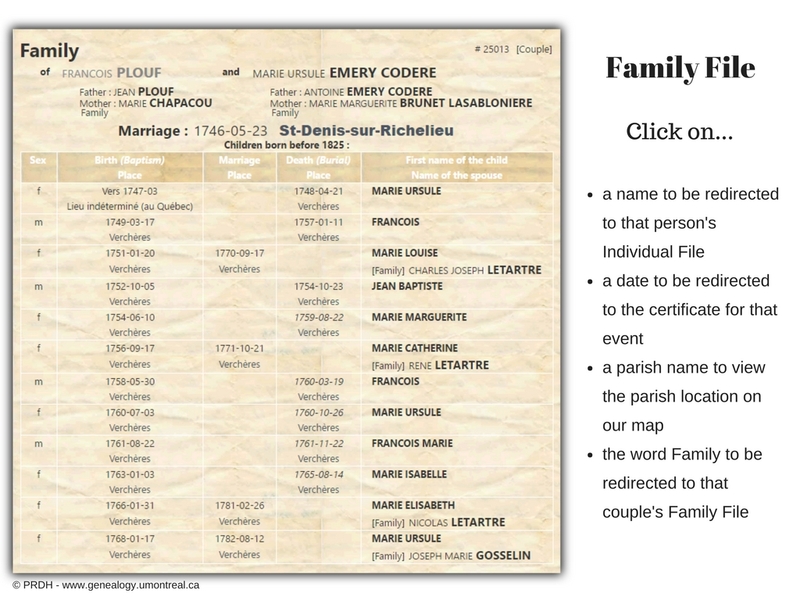 Previous PostPrevious LAFRANCE update, addition of 15 000 newspaper obituaries and new blog articles on Genealogy Quebec!